The missing fingerprints - A Good Man Is Hard to Find - My Search for Ronald H. Tammen, Jr. Shortly after Ronald Tammen went missing, the FBI began their own investigation into his disappearance. Because the FBI is part of the federal government, it’s subject to the Freedom of Information Act (FOIA), which means that an ordinary U.S. citizen can ask them to provide documents on a topic within their jurisdiction, though some exemptions apply. (Actually, non-citizens can submit FOIA requests too.) In April 2010, I submitted a FOIA request seeking everything they had on the Tammen case and, just before Christmas of that same year, the FBI sent me 22 pages. These pages provide much to mull over, and, meaning no disrespect to the G-men and administrative staff who were just doing their jobs back then, they’re a tad sloppy and chaotic. When I shared them with someone who used to work for the FBI and asked him what he thought, he said that it appeared as if a lot was missing. Mind you, this person didn’t have a scintilla of background knowledge on the Tammen case. He based his observation on the fact that the FBI is a memo-happy place (my words, not his), where a phone call or visit generally warrants a new report. In an unsolved missing person’s case from 1953, one would expect more than 22 pages. In addition, several people with whom I’d spoken had told me that either they or their parents were interviewed by the FBI after Tammen disappeared, yet those visits weren’t mentioned anywhere in the documents I’d received. After a few more related FOIA requests that yielded nothing, I appealed, arguing that there must be more documents based on the missing interviews and a couple other pieces of evidence I’d gathered. Months later, I was sent nine additional pages pertaining to the Georgia “dead body” case of 2008. As you can imagine, taking on the FBI can be a challenge, and I won’t be able to cover my history with them in a blog post or two. I need to save some of that drama for the book. However, one of the more surprising discoveries can be found on page 3 of the first batch of documents they sent me. To cut to the chase: when Ronald Tammen’s mother telephoned the Cleveland FBI office on April 30, 1953, to report her son missing, the FBI Headquarters in Washington, D.C. already had his fingerprints on file. When Ron Tammen was seven or eight years old. That seemed odd to my FBI contact and me. He considered it uncommon to fingerprint a child back then because people generally weren’t concerned about the sorts of crimes that we worry about today. I wondered if the other Tammen kids might have been fingerprinted too, and asked Marcia, John, and Robert if they could recall their parents having them fingerprinted as children. They each told me “no.” Although John had no memory of Ron being fingerprinted, and Marcia and Robert weren’t born at the time, Marcia said that she did recall being told that Ron had been fingerprinted in school. I subsequently found a 1960 anniversary article in the Cleveland Plain Dealer that stated, “…fingerprints taken when Ronald was in the second grade at Fairview Park Elementary School are on file in the FBI in Washington.” No reason was given as to why a child would be fingerprinted during the second grade, but the FBI document states that it was for personal identification. Maybe some prescient teacher had the students fingerprinted as a class project. The children could learn about how law enforcement operated while doing their civic duty. Oh, and if (God forbid) one of them should happen to go missing someday, well, they’d be ahead of the game. That’s precisely how FBI Director J. Edgar Hoover would have viewed things too. Hoover felt that everyone in the country should be fingerprinted, not just the criminals, civil service applicants, and members of the military. He encouraged all citizens to voluntarily have their fingerprints sent in so that the information could be used to aid in missing persons investigations, or to help the bureau identify an amnesia victim or an unidentified body. So with the FBI already in possession of Ron’s fingerprints in 1953, wouldn’t that have given them a leg up in their investigation into his disappearance? Apparently not. But here’s the wildest part: If a member of law enforcement were to contact the FBI today seeking a copy of Ronald Tammen’s fingerprints—in the event someone encountered a person who resembled him or someone turned up dead who might have been Ron Tammen—an FBI representative would have to tell that official that no fingerprints exist. To put it plainly, the fingerprints of Ronald Tammen, the central player in one of the most famous missing persons cases in the state of Ohio, were already on file with the FBI the year that he disappeared. Furthermore, although Tammen has never been found, and we are still within the timeframe in which he could feasibly turn up alive, someone from the FBI looked at those prints and decided that, for whatever reason, they didn’t need them cluttering up their files anymore. Someone decided they should be purged. Was it a mistake (and by “mistake,” I mean an act of mind-boggling negligence), or did they know something that the rest of us haven’t yet learned? That’s just one of the questions I’ve spent the past seven-plus years attempting to have answered. Whoa. Whoa. WHOA! WHOA!! WHOA!!! Shame on me for not following your links. Yes, I read all the blogs, but to my discredit didn’t follow all the links. Until today. Wow. Just wow. This is big. This is a cricket stopper. I don’t even want to hazard a guess what this means, but I just had a lot of my assumptions about the case blown out of the water. And in fact, some of what I’ve posted on here just got shot down. 1955, 1957, 1959, 1961, 1963, 1967, 1970. I’ll pop back sometime to this blog and share some more thoughts once my head gets cleared. Lol! Yeah, I think it’s a pretty big deal too! We’ll be discussing more of the FBI docs in future posts. Your comments/questions are always welcome! I give up. Where is the “crim” designation? Interesting the 5/22/73 document cites a SSA violation, presumably draft dodging. There is simply no question that the 20 years is exactly 20 years and not a sort of random event. The May 26, 1953 document even lists the two dates 6/5/53 and 6/5/73 inches from each other. I think there are least 2 FBI employed liars in this case. I’m sure you’ll get back to them. The “crim” is at the top of the 1959 form letter next to his FBI number that starts with 358. There’s also a “cr” on the 1961 letter in the same general location, though I can’t be sure that’s what the “cr” stands for. Then, in one of the letters from the FBI, they referred to his criminal file (which I haven’t posted yet). I agree that it seems that 20 years seems like a logical time point, but why wouldn’t they just say so? Also, I didn’t say in the post who the person was who said he (or “we”) didn’t know what “removed from Ident files” means, but I will now, since he was speaking on the record: Stephen Fischer, chief of multimedia productions for the Criminal Justice Information System, and media liaison for CJIS. If anyone would know, I think he would. I need to run right now, but will be back in touch later to address a couple other points you’ve made. Thanks! 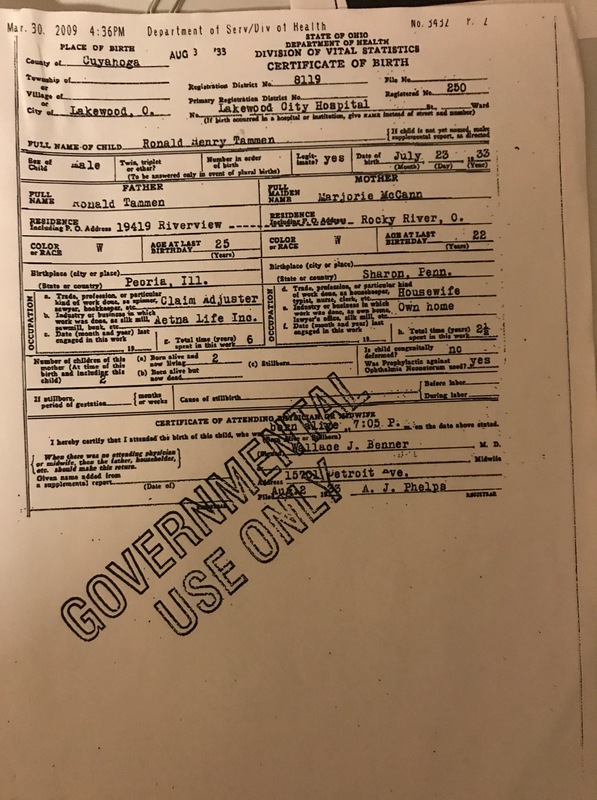 Just noticed the January 19, 1967 document that apparently has a handprinted address of Ron’s dad, listing him at 20000 Lorain Rd and yet some FBI employee managed to mess that up and print it was 2000 Lorain Rd. I don’t think there’s anything at all to it, but interesting anyway. That’s how life is, people make such mistakes, but they can be a real problem for the researcher, who can’t always know if something is a harmless error, or a big clue. The most plausible reason they won’t say what the 20 years was is that they are lying. The dead fish comment was just coincidence is real hard to believe. I don’t know what either one means, neither seems especially important, but I got 20-1 both of them are lying. I totally agree with you that the fish statement seemed like, shall we say, a falsehood. As for the others, I’ve felt as though they are being extremely cautious—like they don’t want to lie, so they are being as evasive as possible. But the other question is that I still don’t know what it meant for Ron’s file to be removed from the Ident files if they still had his fingerprints until 2002. The 1973 letters are interesting. The docs that the FBI has sent me had redacted the name of the Welco employee whose coworker thought might be Ron Tammen. However, I have an unredacted version that I obtained from another source and I’m currently checking into what info I might be able to make public. It’s just a theory, but I happen to think that those 1973 docs—the 1973 report from the SAC in Cincinnati and the follow-up from the Acting Director of the FBI—had more to do with Ron’s file being removed from the Identification Division than the 20-year anniversary of the memo in which Headquarters acknowledges that the missing person “probably identical” with #358406B. But, again, it’s just a theory. I’ll be posting the update as soon as I can. A hypothesis, would need a back-then FBI employee to confirm: There were physically, literally, two files. One for official business, one for FBI eyes only. In Ron’s FBI only file, mention of the fish story and the rationale for the “crim” designation. Your fish story contact forgot where he’d read about the fish, and belatedly recognized his mistake. Interesting—I’ve never thought of the possibility of a separate “eyes only” file! 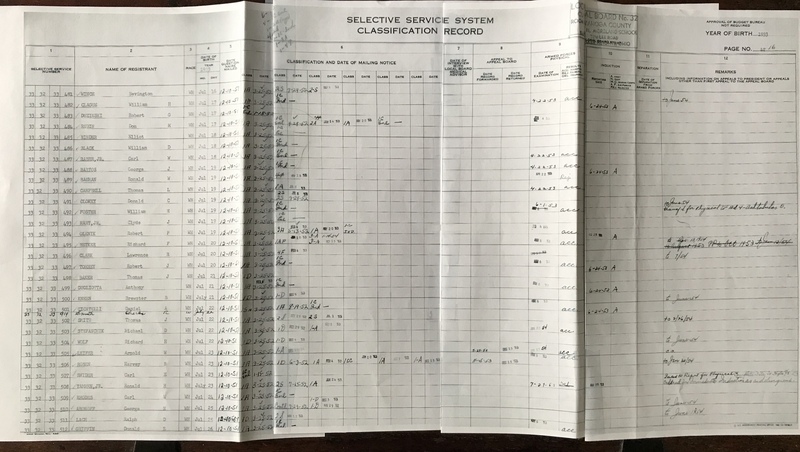 The first “crim” notation was in 1959, four years after the Selective Service issue(which would be the obvious first guess) was apparently affirmed as moot, and long after the prints were first taken(the claim of the FBI that all prints were listed in a criminal file in those days notwithstanding)….very odd. I’m still pondering that one. Yeah, it’s a conundrum. I’ll be going into greater detail on this question soon. Thanks for your thoughts on this and the other topics! I’ve been reviewing the FOIA, and it’s troubling. While all the descriptions of it mention that it was meant to provide “information” to the public, all the stipulations to various agencies as to what they must give the public are apparently in terms of “documents”. There’s a huge difference and you’ve mentioned your appeals for information that don’t exactly seem like appeals for documents and I’m guessing that is the problem. In any case, why not go for it and ask for the identities of every single person whose initials appear on every single letter to the Tammens? They’d probably claim employee privacy, but on a 60 year old case? Besides, a refusal on that would be rather telling. Of particular interest would be “MSL” who made the “6-5-53” and “6-5-73” notations on the May 26, 1953 document, and “HAC” who probably made the “crim” and “cr” notations on the November 16, 1959 and October 31, 1961 documents. I’d guess most of them are no longer with us, but who knows? The problem of course, is you could ask for that and follow up with “Does the FBI follow its own rules?” and you’d be after information, not a document. And since I am already full of crazy ideas, here’s one more: Appeal to Paul Ryan to amend the FOIA to include its intended role of releasing information as well as documents. Really, so many thanks for what you’re doing. I have thought about this case for almost 40 years and it’s so nice to see someone working on it. I hope the chase is its own reward. Interesting…not sure how far I could get if I don’t have the person’s full name, but let me think on that. If there’s a way, I have the will to try! But here’s an example of how difficult some agencies are regarding FOIA matters. I have a memo on which several names have been redacted that I would like to have unredacted since the people whom I believe are mentioned are long dead. After many months, the agency in question unredacted someone’s name from the To: line (let’s call him John Smith for now), but not the three names in the body of the memo that I had requested. On a whim, I submitted a follow-up FOIA request on John Smith—seeking whatever info they had on him—and they came back and asked which John Smith I was referring to. That was their response, even though they had decided it was OK to release his name and they knew exactly which John Smith I was referring to. It’s games like that that drive me crazy. By the way, I was able to come up with all kinds of identifying info on John Smith and, 17 months later, I’m still waiting on the docs. were found in his room. Do you agree? I thought I’d read somewhere you do not. Cella does validate the strange blood typing story. Because details can shift over the years, I’m inclined to believe the 1953 Enquirer account, since details about the state of the room were fresher. If there was any money left behind, I’d think the reporter—who didn’t have a byline but I believe it was Gilson Wright—would have included that detail. I can provide additional back-up articles when I have more time to devote to this question, but hopefully this helps for now. Thanks again.